Are your Turn Times for Loan Estimators ("LE's") as Initial Disclosures Same Day / Next Day? We Double the Productivity of Setup Staff from about 5 Initial Disclosures per day to about 10+ . Are your Turn Times for Initial Underwrites at 24-48? We assess all available documentation md publish defects to all parties to the loan so they can fix prior to Submission and ...We Double the Productivity of your Underwriters from about 1 Clear to Close per day to 2+ . Are your Turn Times for Closing Disclosures ("CD's") Same Day / Next Day? We notify Processor, Underwriter and Management of Pre-CD Defects so they can fix them before Closers get to the file and We Double the Productivity of your Pre-Closers from about 4 CD’s per day to 8+ . Are your Turn Times for Doc Draws ("Docs") Same Day / Next Day? We notify Processor, Underwriter and Management of Doc Prep Defects so they can fix before Closers get to the file and We Double the Productivity of your Closers from about 4 Doc Sets per day to 8+ . Quatrro Mortgage Solutions injects fresh thinking along with a suite of new solutions to revolutionize the ever changing financial industry. Our distinct offering leverages robust platforms, proactive support and a winning business partnership. We serve the financial industry passionately and leverage a great combination of domain expertise, technology and global delivery. Are your Turn Times Fund to Sold at 14 Days? 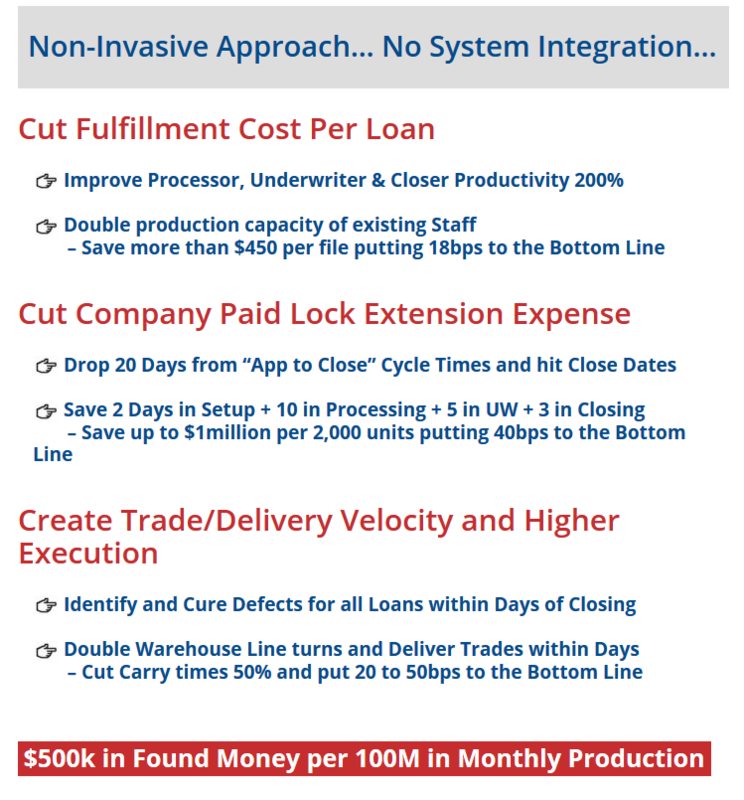 Are you paying Overtime in Setup, UW or Closing teams? …and, we Don't Process, Underwriting, Doc or Ship files! …this is not outsourcing …this is Operating Leverage for your team which is a Retention Play for your Best People!